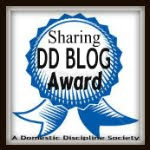 We've been doing our homework - reading all we can about Domestic Discipline. Forums, blogs, websites, documentaries, diaries and more. There's a lot of interesting ideas and great creativity too out there!!. 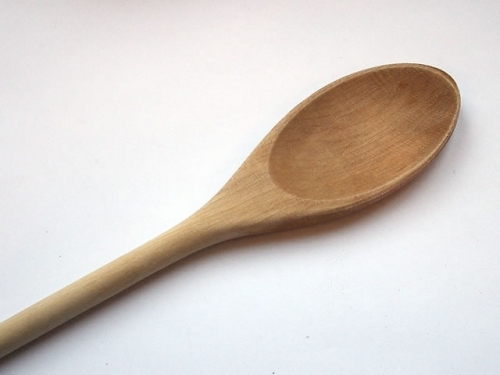 Among many of the topics regarding DD are implements for spanking. People's preferences differ from person to person (couple to couple) and among these implements - many prefer the wooden spoon. We totally respect that people should use what ever works for them. To us - the heart of the home is the kitchen. Here we feed each other, talk, relax, play games around the table and just have a cozy time together. In our kitchen we have lots of wonderful utensils! We love all our utensils - especially those made of wood. In fact - most of our utensils are made of wood! So Jack's getting the best paddle we could find - one that only lives in our bedroom! A beautiful paddle hand-made by .The London Tanners! So if you ask us - To Spoon or not to Spoon? Nice paddle. I hope you still like it after he uses it. I agree with you though, I'm not a wooden spoon fan. Good luck! He's got a temporary paddle now - so I know what to expect! I really do try to change and be good. This week I'm going to work hard on NOT telling him what to do - and leave it all to him. How are things by you? oooh, that paddle looks like it will hurt! The worst implement ever is the rubber ruler we have... yikes! I love the paddle! London Tanners produces very high-quality implements. Lucky you! Yes, London Tanners have some lovely implements. I'm tempted to buy one for P's Christmas present. London Tanners has a great reputation. Also Adam and Gillian. Very nice service and good products. The advantage to not using a spoon is that you don't cringe when you cook. True story. I tend to find that wooden spoons are a prime source of bruising especially if used without a warm up. Although I don't bruise as much as I used to, anything narrow or small or that 'wraps', like a belt or strap, seems to be more of a problem for me. On the other hand, a large and heavy wooden paddle that looks pretty formidable does not bruise at all. I was rather puzzled by this until an engineer friend came up with a theory. He pointed out that small implements tend to centre all their force in one small spot and to contact with the skin at the edges, whereas larger and heavier implements spread the force more evenly over a much larger area and don't contact the skin with their 'sharp' edges. Odd though it may sound, it does seem to work that way for me. Our paddle arrived yesterday and darn, does it pack a wallop! Looks a whole lot better than it feels! - and here we made an agreement to do reminders and enforce Jack's authority by maintenance - every day - all this coming week! I better get me some freezer gel - quickly!